The Federal Highway Administration (FHWA) has determined that the proposed action described in the I-25 South Gap Environmental Assessment (EA) will have no significant impact on the human or natural environment. The Gap is an 18-mile stretch of I-25 from south of Castle Rock to Monument. It is the only four lane section of I-25 from Denver to Colorado Springs. Over the years, congestion, crashes and delays have grown due to population growth and more people using the road. Improving the Gap is a top statewide priority. CDOT has been working with localities and the public along the corridor to develop and complete the study phase&mdashlthe Environmental Assessment. CDOT will be ready to start construction summer of 2018, pending funding. Widen 18 miles of I-25 from south of Castle Rock to Monument by adding an Express Lane in each direction. Drivers would have the choice of using the Express Lane for a reliable trip in exchange for a variable toll or ride the two existing general purpose lanes for free. Carpoolers (vehicles with 3 or more people) could ride the Express Lane for free. This is likely the best option that offers motorists trip reliability over the long-term. For more than a year, CDOT has undertaken a Planning and Environmental Linkages study to identify a long-term vision for the 34-mile stretch of I-25 from Monument to C-470. As a result of the study, CDOT identified the Gap as the most urgent priority. To address that priority, CDOT has conducted an Environmental Assessment, with the goal of having this stretch of the highway ready for construction in 2018. 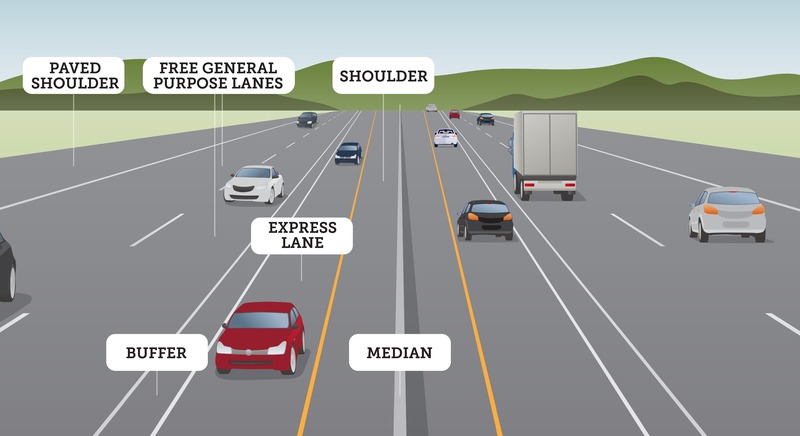 As documented by the Environmental Assessment, Express Lanes are the preferred alternative because they best meet the purpose and need of the project to improve safety, travel reliability and mobility. Two public hearings were held in May 2018, as well as ongoing public outreach and collaboration with public officials and localities along the corridor. The public had 30 days to comment on the project following the release and posting of the EA. Those comments are being reviewed and will be responded to, with documentation posted on this site by late June.